I have been on a bran muffin kick since my taste buds were turned on by the Albemarle Baking Company box of treats our neighbors brought us when Birch was born. During my research of consuming one half a giant muffin at a time, I discovered that the Mudhouse Coffee bran muffins are amazing as well! As a result, exhibit C was born: a healthier, properly portioned, semi-homemade bran muffin I can pull out of my freezer and enjoy anytime. Served warm with butter, this muffin can run with the best of ’em. I froze most of my batch and pull them out when a craving hits to heat up in the toaster oven. Fancy up your favorite bran muffin mix with cherries, coconut, and carrot for increased texture and nutrition! Prepare muffin mix as package directs. Stir in cherries, coconut, and carrots. Bake per package directs and enjoy. And if you know me well (and many of you do!) you’ll know that I crumble muffins on top of anything! Yogurt is a favorite. Oatmeal too! 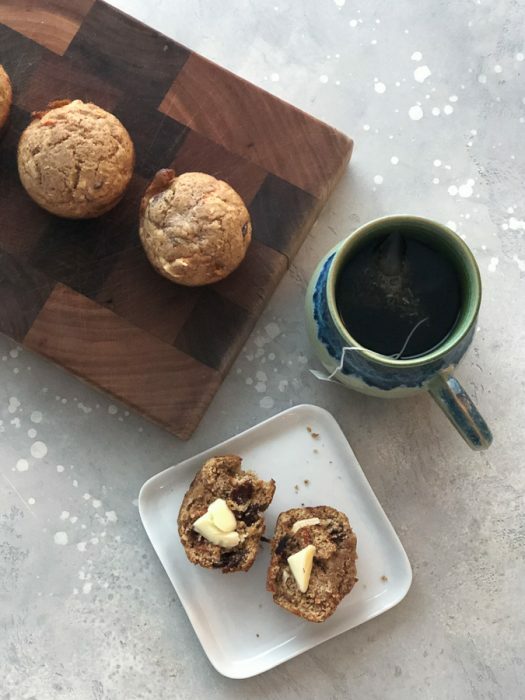 The post Jazzed-Up Bran Muffins appeared first on Kath Eats Real Food.